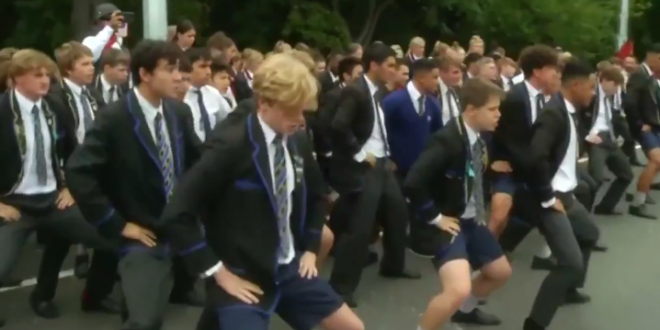 STUNNING: New Zealand Students Perform Defiant "Haka" Ceremony In Tribute To Terror Victims [VIDEO] - Joe.My.God. A quiet Christchurch street has been awoken by the roar of the haka. Dozens of teenaged boys performed the ceremonial dance in a show of unity and support with New Zealand’s Muslim community. The group of boys from Christchurch Boys’ High School walked down to Hagley College to give their respects to the loved ones of those killed in Friday’s attack. Hagley College has been transformed into a welfare centre, where families and friends have been grieving and praying together. Tears began to stream down the faces of some people watching as the boys performed the traditional dance. Head boy Fergus Kilpatrick, 17, was among the students, and said it was an honour to perform the haka. Other haka tributes were performed a group of students that included girls, by a group of surfers, and by a biker gang. Watch them all. Watch as these proud men perform a powerful Haka to commemorate the victims of the Christchurch mass shootings. This happened at Surfers Paradise earlier today.